NOT so much ho-ho-ho, as ho-hum. Everywhere you looked on Christmas Day's telly it was the same old programmes, last year's favourites reheated like stale mince pies. On every side were repeats, rehashes and return visits - all testimony to a crisis in Christmas creativity made worse by doses of po-faced and sanctimonious piety. Nowhere was this more painful than on the wretchedly dull Doctor Who (BBC1). There's a tradition that the Time Lord's festive outing in his Tardis is a silly affair, all larks and jingle bells, like a nudge in the ribs from a tipsy uncle. Not this year. Set partly on a World War One battlefield, and partly in a crypt containing the memories of a trillion dead people, it was achingly, earnestly worthy... not to mention knee-deep in self-pity. The more seriously this show takes itself, the more people switch off. Ratings tumbled during the last series and, if anyone was still watching by the end of the hour, it was only because they wanted to see Peter Capaldi turn into Jodie Whittaker, as the Doctor's first female regeneration. Self-important to the last, Paisley-born writer Steven Moffat who is leaving the show - refused to oblige, and permitted us only a brief glimpse of the Lady Doctor. No sooner had she appeared than the Tardis tipped her out into space. Perhaps it doesn't want a female Doctor either. Before that, we had to endure an age of Capaldi wringing his hands and begging humanity to 'be kind'. David Bradley reprised the First Doctor, originally portrayed by William Hartnell in the Sixties. His chief role was to make scandalising remarks about the importance of having a woman about the place to do the dusting, and to look horrified when Bill Potts (Pearl Mackie) hinted she was a lesbian. APA 6th ed. : Stevens, Christopher (2017-12-26). First woman Doctor plays second fiddle to right-on smuggery. Daily Mail p. 11. MLA 7th ed. : Stevens, Christopher. 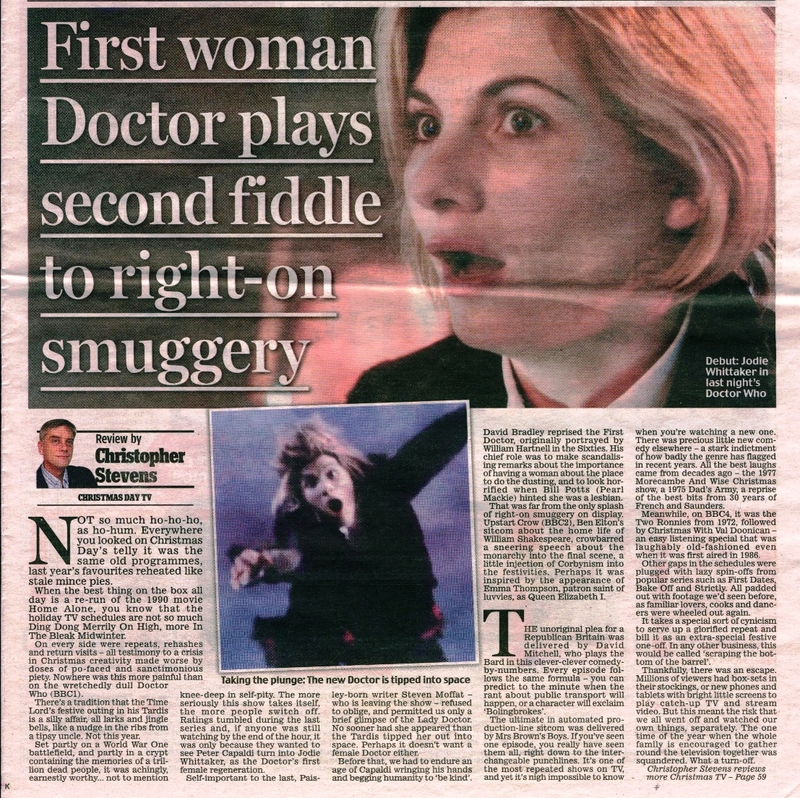 "First woman Doctor plays second fiddle to right-on smuggery." Daily Mail [add city] 2017-12-26, 11. Print. Turabian: Stevens, Christopher. "First woman Doctor plays second fiddle to right-on smuggery." Daily Mail, 2017-12-26, section, 11 edition. This page was last modified on 8 April 2019, at 00:23.